The apex angle of rays passing through the front nodal point of a lens. The apex angle is measured at the apex of a usable cone of rays entering the lens of the camera. Lenses are normally classified according to their angle of coverage. 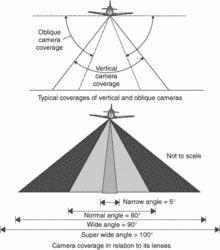 Angles of less than 5° coverage are classified as narrow angles; those with coverage of 60° are classified as normal angles; wide angles provide 90° coverage; and superwide or ultrawide angles' coverage is greater than 100°.